The success of a gastronomic establishment heavily relies, among other things, on the quality of the meals and the ingredients used. With the Thunderbird food processor TBR-580 you can grate and cube fresh and unprepared vegetables without losing any of the freshness. This model can process nearly every vegetable there is and even produce curly and julienne fries. 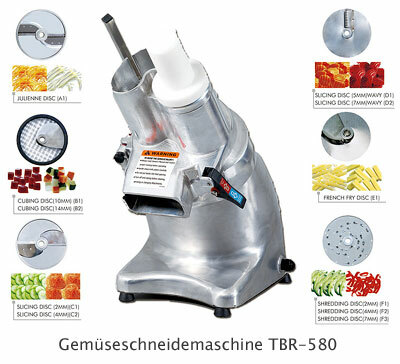 The food processor TBR-580 is not just the forerunner for fresh and high-class cooking though. It also creates a visually appealing arrangement out of any vegetable. As the old saying goes, “the eyes eat as well”, you can take your customers to your culinary world and enchant them. You save a lot of manual labor and therefore operating costs. At the same time you lower your expenses significantly if you use unprocessed vegetables instead of already processed ones. By using fresh and previously unprocessed vegetables your establishment will set itself apart from the competition that uses canned or already processed food. This will lead to a rise in quality and popularity of your establishment – two factors that lead to success.